Welcome to this Vaio F Series site. 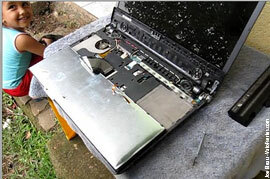 I'm just a Joe Bleau living in Costa Rica & having fun modifying & trying to get the very best out of a Vaio F11 notebook. The Vaio F Series is inexpensive considering it's specifications & it's quite easy to customize & optimize to squeeze the very best performance this laptop is capable of with a Windows 7 64-bit OS. The updated Vaio F12 & F13 versions are almost identical so the stuff found here can be applied to them to. My VPCF115FM laptop was bought in USA & brought to me by a friend visiting Costa Rica in February 2010. I use it every day since then and as of May 2012 I had ZERO problem with this laptop. Check Vaio F Series Fan Cleaning or Keyboard Replacement to reduce the fan speed at idle by 500 RPM or more if using it in dusty environment or owing since more than 6 months. It's a powerful machine that needs proper cooling and it's surprising how just a little dust can raise the fan speed on this model. Sony USA Support is far away from the Monteverde cloud forest mountain range where I live so that means DIY all the way & hopefully you may find some useful tips on this Sony Vaio laptop owner's site. The Arenal Volcano as seen from a lookout 10km from my house. The OEM Windows 7 64-bit OS for Vaio F.
All the Vaio Value Added Software can be disabled or uninstalled. A ton of processes can be eliminated to speedup booting, reduce resource usage, fan speed rpm @ idle & operating temperatures. Hard drive upgrading & adding a secondary hard drive even if the Vaio F Series does not have a dedicated secondary hard drive bay. The Intel CPU, Sharp LCD, keyboard, memory, Wi-Fi card, etc. I'm working on a solution so you could add comments & suggestions. Meanwhile you can use the Contact page. Please do as 80% of what I know about the Sony Vaio F comes from other F owners sharing their knowledge, experiences & images. I try to make the guides accessible to newbies & include links to external resources for more info.